If you’re looking to get whiter teeth without having to visit a dentist, then you’ve probably considered trying a home-based solution. Here we explain – in plain English – the science behind how teeth actually become stained, and what techniques teeth whiteners use to restore them to their natural colour. We’ve also listed the 7 best teeth whitening kits you can buy in 2018. The Swiftwhite Premium teeth whitening strips are a popular choice in the UK. It’s easy to see why. They deliver results. Within 14-days. One 28-strip pack is all you need to get started. Just take the strips out of their pockets and easily apply one to your top teeth and the same again for your bottom set. All you need to do now is stay relatively calm for 20-minutes and enjoy the fresh coconut flavour. Like all good teeth whitening stips, Swiftwhite is desinged and tested by UK dentints and only uses chemicals that are approved by EU laws. On average, users increase their teeth shade by six shades within seven days. 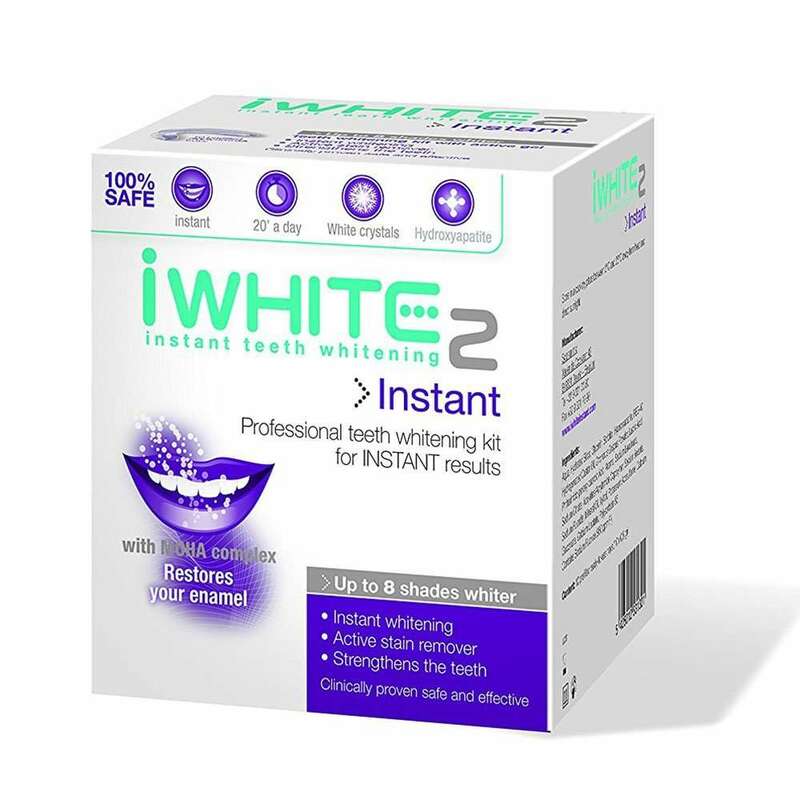 Spotlight Whitening Teeth Strips is a product developed by two cosmetic dentists based in Galway, Ireland. 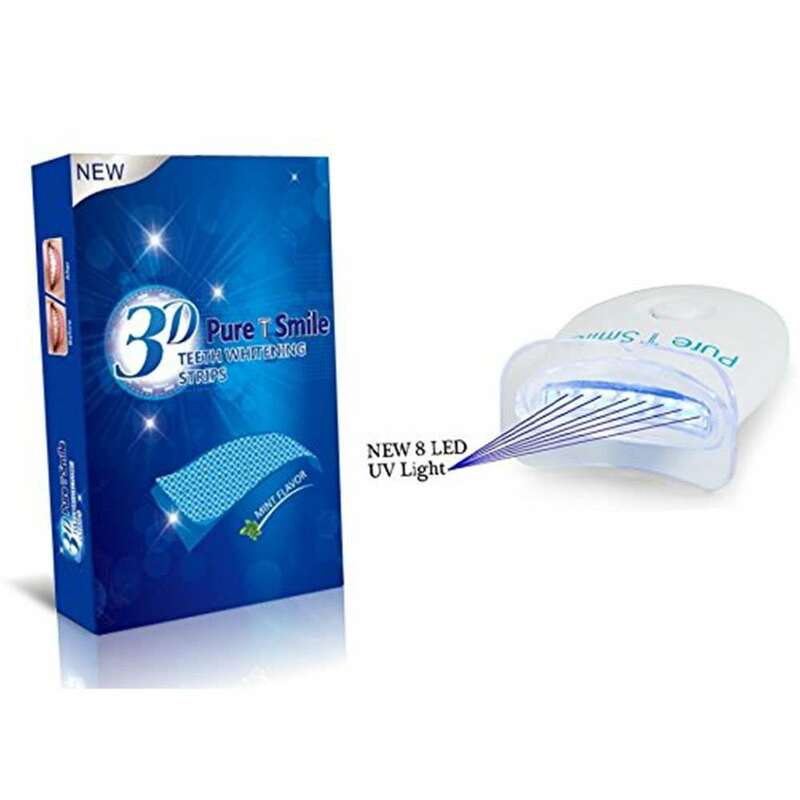 This product represents a well-priced teeth-whitening solution that achieves fast results. We’ve ranked this kit at number one because of its price, simplicity, use of peroxide and because it actually works. Using these strips is simple. Tear open one of the foil packets and identify the top and bottom strips. Next, you need to dry your teeth (this aids adhesiveness) with a paper towel and place the first whitening strip on the lower teeth and repeat the step for your upper teeth. Leave these strips on for 60 minutes then remove and rinse away any residual gel. Repeat this every day for two weeks. This is a great option if you want the benefits of a non-peroxide whitening agent, combined with the power of an LED light. It’s simple to use too. Just apply 1ml of gel to each wall of the mouth tray (using the provided syringes) focusing more on the frontal 6-8 teeth that are visible when you smile. Then turn on the LED light, then bite down on the tray – holding it in place with your teeth and lips. 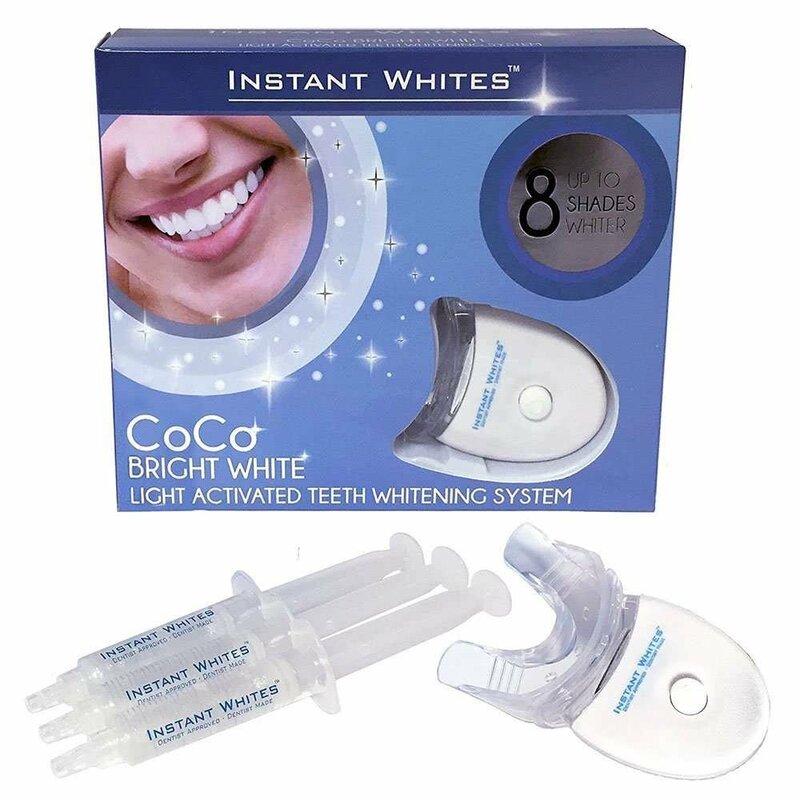 Treatments last 30 minutes each and users should see significant whitening results after seven applications. This is an alternative, but equally effective teeth whitening kit as the option above. 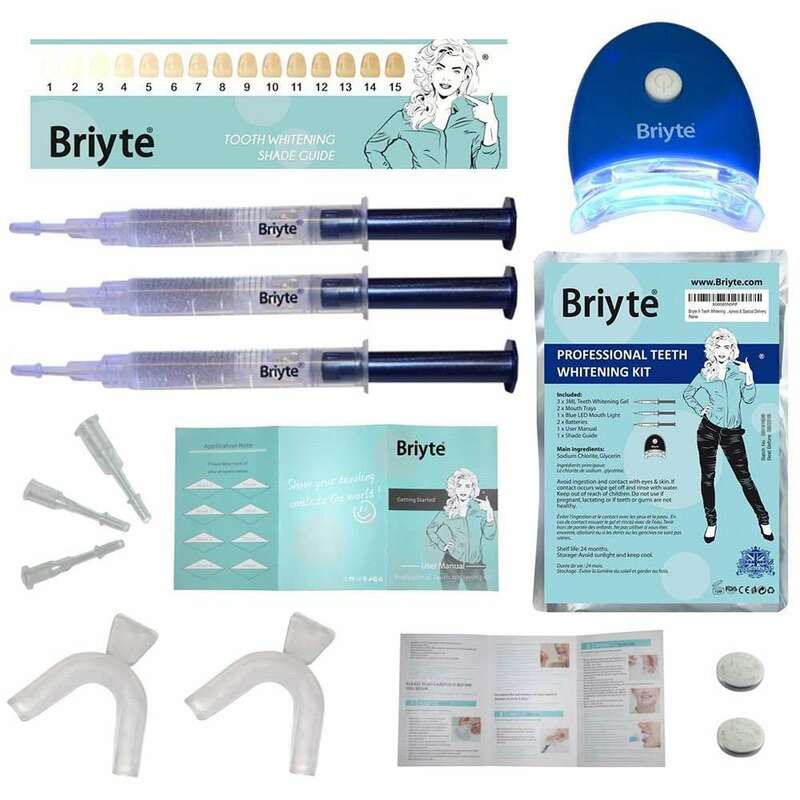 The main difference here is that the Briyte kit comes with two removable mouth trays that can be moulded to fit tightly to the wearer’s individual teeth alignment. Users will need to soften these trays using hot water, then they just need to press the mouth tray firmly against their teeth. This solution is all about ease-of-use. We like it because it comes with 10-prefilled trays, meaning all users need to do is open the packet and bite down on the mouth guards for 20 minutes a time. That’s it. If you’re looking for a non-peroxide way to whiten your teeth in a mess-free way, this is what we recommend. Like all whitening strips, they’re easy to use. Just open the disposable packets and apply the strips directly to your teeth. Yesmile strips only need to be worn for 20-minutes too, making them a great product for on-the-go teeth whitening. T Smile offers a non-peroxide alternative to teeth whitening strips. However, they work in the same way as the Spotlight Whitening Teeth Strips above. All you need to do is clean and dry your teeth, then open the packaging and wrap the strips around your teeth from back-to-front. Leave the strips in place for 15-30 minutes and insert LED lights to accelerate whitening Remove and rinse when complete. There are plenty of misconceptions about teeth whitening. For example, many people believe eating correctly can restore teeth to their natural whiteness. It can’t. Dentists the world over consistently say the same thing, and it’s that Peroxide is the most effective solution. Other whitening agents do work, but if you want results, peroxide is the way to go. The reason for this is because teeth are made up of multiple layers and when the top two layers become stained, only chemicals can restore whiteness. Enamel is teeth’s top layer and the first line of defence. Underneath this is Cementrum, which protects the root. The final layer is the Dentin layer. Over time, the stuff you’ve been putting in your mouth – all food and drink – forms a fourth layer, the Pellicle. As yet more time passes, stains from the Pellicle layer gradually work into the teeth’s enamel, and no amount of brushing, flossing or mouthwash can remove these stains. Enter Peroxide. The best way to restore teeth’s natural whiteness. Will Whitening Kits work on my teeth? The effectiveness of teeth whitening kits depends on your teeth. Younger teeth are the best to respond to teeth whitening kits. The reason for this is simple, they have been subjected to fewer years of staining. Whitening will work with older teeth too, but just not as fast. Yellow-stained teeth (naturally stained) are also better suited to teeth whitening than grey teeth (caused by smoking or taking certain medication). Veneers don’t respond to teeth whitening kits at all. These have to be replaced to create whiter teeth. Peroxide is can cause harm. Don’t forget that. If you expose your gums or flesh to too much peroxide and it may blister. Because of this, DIY teeth whitening kits have a lower percentage of peroxide in them compared to what you’ll find at dentists. Usually, home kits have a maximum of 10 percent hydrogen peroxide or 35 percent carbamide peroxide. And this is the primary reason DIY kits aren’t as effective as the professional ones used by dentists. Dentists use a higher concentration of peroxide in tandem with custom-made mouth trays and years of medical training. Do LED lights actually whiten teeth? Some home teeth whitening kits will come packaged with LED lights. The theory here is that LED lights will speed up the chemical reaction taking place when the whitening gel or peroxide on your teeth. There’s a lot of discussion regarding whether they actually work or not. The controversy has caused by certain manufacturers selling LEDs without the correct whitening agent. When used properly, LEDs (Light Emitting Diodes) accelerate the breakdown and performance of teeth-whitening agents. When used with the correct whitening agent – hydrogen peroxide, for example – LEDs have been shown to accelerate and improve the results from teeth whitening kits. Don’t confuse the home-use LED lights with the professional UV lights dentists use. They are totally different. UV lights should only be used by professionals.